Motivation is something everyone has inside of them. When we wish to do something, it’s because we’re motivated to do so. People invent, discover, adventure, and interact all due to the motivation inside of them. There are many different things that can motivate you to do something, and even to not do something, in your life. The only way to understand motivation is to relate to the situations in which you need it, and that just so happens to be everywhere. There’s no person who can claim they’ve never been motivated to do something. Good, bad, selfless, selfish, they’re all members of the motivation family. And this book will take you on a journey where you can find ways to make the best of your motivation. Going by the dictionary definition, Motivation is defined as so; ‘a reason or set of reasons to accomplish something or behave in a particular manner’. It’s a form of driving force we all have, which pushes its own pedal when it sees opportunity. For instance, when you see an ad for a new job opening and you happen to be looking for something new or different, doesn’t the voice in the back of your mind say, ‘why not?’ And even if you’re not looking for something new or different, motivation may just prompt you to ask that very same question in any case. To state it simply, motivation becomes the thriving ambition to have something accomplished in life. This motivation can help you figure out problems when you’re stuck, get over overwhelming emotions, and help you aim for new heights. We all have ambitions, dreams, and aspirations and the more you allow your motivation to inspire you, the more you can get done. It can help you overcome habits as well. Things like drinking and smoking can stop when you’re motivated to see the end of it. Otherwise, it’s hard to dedicate to something if you do it reluctantly. 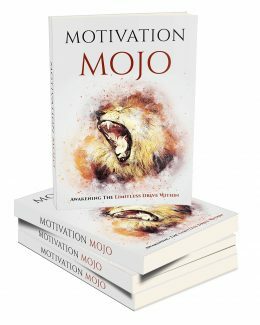 However, with motivation, you are driven by a feeling of willingness and inspiration that makes you a lot more ready to take action for or against yourself. There’s little to debate that motivation is the key to progress. Everyone must develop their own passions in order to evolve in life. When you want to grow or improve yourself, you have to try new things. Without doing so, you won’t achieve things such as self-recognition and respect, which are vital aspects in a healthy life. You may not realize it, but you motivate yourself every day in many small ways. For instance, right now, you’ve just motivated yourself to read through this book. Chances are you’re here because you’d like to better some aspects of your life. Or, on a more generic level, you go to work because there is the motivation of a paycheck at the end of the month. You work hard so that you can earn appreciation and acknowledgement among peers, or perhaps the ability to do something that you love motivates you to get up every morning and go to work. If you have a great boss at work, someone who takes time out to know their employees or appreciates a job well done, maybe that’s what motivates you to go to work and give it your best. Workplace issues aside, you also motivate yourself in many everyday situations. If you’re a giver or someone wishes to help others, you may be motivated to donate your time or money to a cause. If you’re driven by a desire for achievement, you may spend hours studying just to get into a prestigious university. Likewise, if self-expression drives you, you may be motivated to become a writer or if you’re an athlete then perhaps you’re driven by the thrill of a sport, the challenge of winning the game, or you are simply driven by playing at your personal best. At its simplest, this is what motivation is. It can come from yourself, or someone else may push you to do something. Wherever the source, motivation is the initiative to succeed and surpass limits you or anyone else draws for you. There are many situations in which motivation can affect your decisions, but they don’t all come from the same motivator. Some things require a big step to take action, while others like the above mentioned just need a little shove to get you going. That is the magic of motivation. There are different motivators that occur in your life to help you get going. Some motivators are big, like quitting a job or moving from one city to another. These motivators get you on your feet for change almost immediately. You’re going to need a job, so you have to work for one as soon as possible. A smaller motivator could be getting a limited-time, two-for-one deal at the mall. You may not realize it, but at that very moment you’ve been motivated to take that deal and buy the product. It may be the typical market scam but it’s the ideal example of motivation for it gets you to act quickly by setting a time limit on the deal.